Meet Clyde and Niki at their Big Cypress Gallery Saturday, August 11th from 10am-4pm. They both will be showing some of their new works and will be available for book and calendar signing. 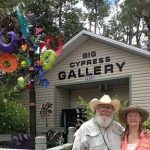 They will be introducing our new visiting artist Leslie Peebles which has been visiting our Big Cypress Gallery for years drawing and painting our surrounding area. We are very excited to introduce her beautiful work at our gallery. Leslie is a painter and printmaker who specializes in linoleum and wood block relief prints, oils, and encaustics. Her newest pieces are mixed media that combine relief print with encaustic medium. Her works will be on exhibit until December. August is one of Clyde’s favorite months to photograph the Everglades, and he is looking forward to spending some time in his Swamp Bungalow behind the gallery photographing for the month of August.